It’s official. You can continue taking your best friend onboard! As of December 6, we officially changed our policy to allow leashed dogs on our trains and buses. Since the summer, we’ve been testing out a different approach for dogs travelling on our trains and buses. We received positive feedback from customers, their furry friends and our staff about the pilot so we’re making changes to our policy. You and your dog must use the lower level of trains and buses. Be sure to pick up after your dog, but do not dispose of their waste on trains or buses. If possible, please avoid bringing your dog onto the accessibility coach as it tends to be the preferred coach for service animals. 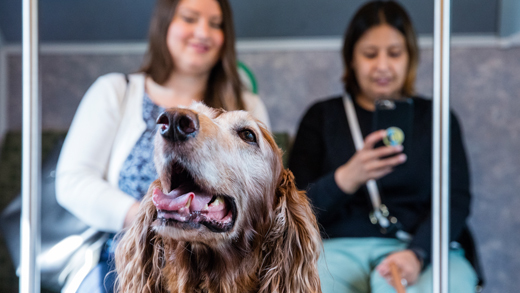 If you’ll be transferring to or from another transit system, be sure to check with them in advance as they may have different rules about travelling with dogs. To find out about the Dog Owners’ Liability Act, click here. For tips about travelling with your pet, visit the Responsible Dog Owners of Canada Association.